Laura loves pizza y’all! Always willing to travel the world and taste the vegan stylings…. For those of you who don’t know, I am a bit of a pizza junkie. Unfortunately I do not live in a particularly “hot” vegan pizza zone so I’ve been getting by on frozen Tofurkey pizzas and ordering cheeseless pies from the local pizzerias. A friend told me to check out Amici’s Pizza, multiple bay area locations, the closest to me is about a 15 minute drive. She assured me they had vegan options on their menu and that you could also design any personal pizza as their basic crust and sauce is vegan, then you can choose Daiya mozzarella as your cheese option. Although I love to have some extensive vegan meat options on my pizza pie I was pretty stoked about theses offerings so I immediately decided to check them out. Immediately I liked them as you can order online. As tragic as it is, I hate calling and talking to strangers, I don’t know why I just never don’t find it awkward. However, they don’t clearly mark their vegan options in any way which is a shame. I ordered the Asante pie (veggies and Daiya, no tomato sauce) and garlic breadsticks. Unfortunately upon arrival the clerk ringing me up immediately told me the garlic breadsticks weren’t vegan. I had two reactions. 1) Isn’t is thoughtful that the clerk would mention that to me right away? Excellent customer service, I much appreciate this. 2) Dang it that’s annoying, I wish that had been marked on the menu so I wouldn’t have made that error. Anyways I thanked her for her candidness and paid for and took the breadsticks anyway. I felt it was my fault for not calling and asking if the items were vegan, I didn’t want to make a stink and then not pay for what I ordered. Tossed the garlic sticks and devoured my pizza shortly after. It was a great pie. I loved it. If anything there was a little too much Daiya. True pizza connoisseurs will know what I’m talking about. There’s a correct delightful amount of cheese on a pizza and then there’s like that Dominos stretchy thing that becomes too much. This danced on the border for me, but it tasted great and I will definitely be ordering more. 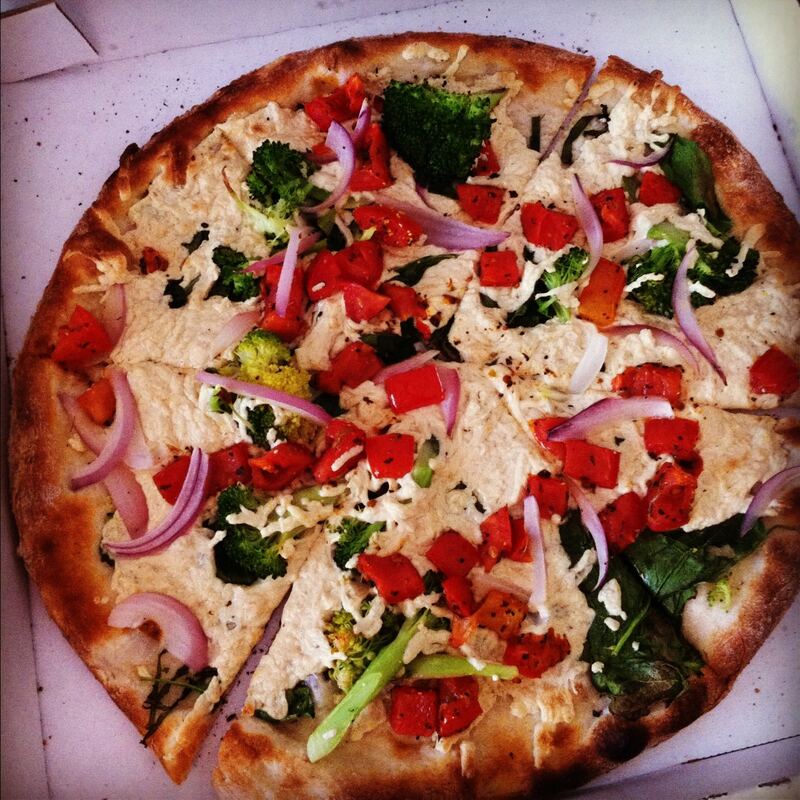 Thanks for the vegan options Amici’s pizza!